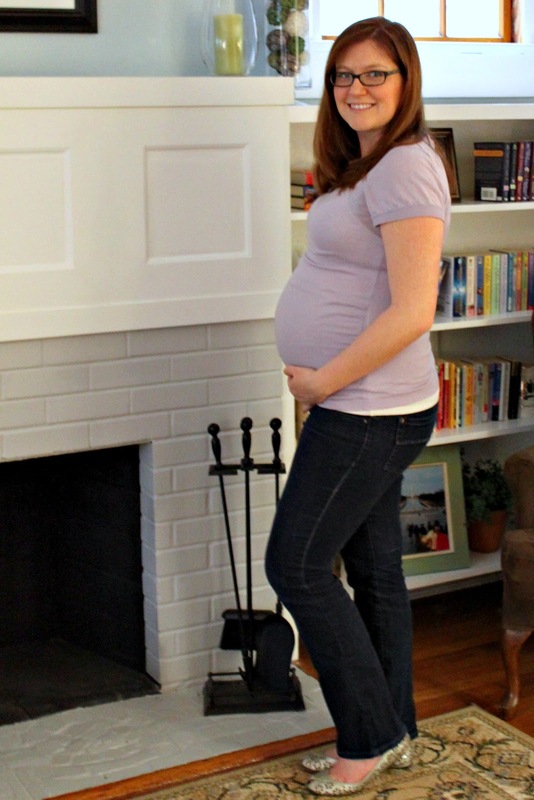 Accelerated Baby: 26 weeks - with photo! so here go the glasses again. Gah. Record lows in VA. Actually I don't know if they are record lows, but they see like it to me. It is flipping freezing, and Herman has made a triumphant return to my bedroom. Dear Sun, I need you. Kthanks. I just read a startling statistic that I can expect my belly to grow 1/2 an inch per week from this point on out. WTH. That is roughly 7 inches. I measured in 12 different ways and I am hoping that means overall circumference as that is the smallest outward growth. But, seriously. That is ridiculous and I am not happy. I immediately felt the urge to slather on more lotion. I have managed to get this far with no stretch marks and was feeling happy about that, but then the gods laughed at me. Clothes are starting to get more difficult already. My maternity dresses are ROCKING, but I already have a long torso, so some shirts are short on me, though they fit everywhere else. Add in a preggo belly and well, no one wants to see that going on. Dear weather, please cooperate so I can switch to dresses and flip flops immediately. Doing ok. I have been able to avoid most cravings. Like, all of a sudden I will think "I need Doritos, now" but I distract myself with something else and the feeling goes away. Also, I went to church this week and the priest spoke about water. specifically how water is symbolic in birth, sustainment, nourishment, baptism, all sorts of things. To which I replied, alright God. I get it. I will keep drinking water. Bah. Is this one of those things that people swear I will get addicted to, like running? Because that never happened for me. I am like an old lady these days. HELLO SCIATICA. I have started having some sharp sciatic nerve pain, which is obnoxious and makes me hobble around. I googled how to get rid of it and did every recommended stretch and exercise on the floor last night, which made my baby daddy laugh. But, it did finally convince him that a back massage would actually help me. It comes and goes, and I am annoyed. I think I may bring in an exercise ball to sit on at work. Good idea? Bad idea? Discuss. Sciatic pain = not sleeping well. I manage to get an ok amount of sleep, but it is very off and on. We did manage to make some progress this week in the fact that we ordered the crib and bought the nursery curtains. Now we just have to clear crap out so there is room for said crib when it comes. Boo. Nesting has kicked in. I talked to my mom for an hour and a half on Saturday and while we were talking I was washing the faces of all my kitchen cabinets (because that is so important, yes?) and doing laundry. It may just be genetics though because she was scrubbing toilets on her end. I also managed to scrub my kitchen floor on my hands and knees (because that is the way my mom taught me was right, and that was how it needed.to.be.done this weekend - may have contributed to back pain, but whatevs, it was necessary) dust and vacuum and wash every pillow cover in our house along with slipcovers. Still to come this week - the upstairs. Great. Hoping it stays that way when the pollen count goes for record highs in a few weeks. Bigger and bigger. No interesting colostrum developments yet. Sort of wondering when that will happen. Comes and goes. Trying to be good and drink water and move around. Still small amounts, thank goodness, but I notice. Girls partying in pretty dresses and heels at a loud bar, one girl sits with a water on the rocks, twist of lime, obviously pregnant and obviously married thanks to rings on her hand. Guy walks over to sitting girl "Hi, My name is Brett, what is yours?" "Hi Brett, I am Courtney." "So, what's your deal? You don't drink?" Girl points with both hands at obviously pregnant belly, "Not right now, I am pregnant." Guy, obviously surprised, "Oh wow! You look great, how far along are you? "Oh wow! You know, my friend back home just had a baby!" Proceeds to take out cell phone and show pictures of said baby. "Well, that certainly is a cute baby, you have a good night Brett"
"Ouch! You just 'good nighted' me. That's so dismissive." This is me attempting to give my unborn child shaken baby syndrome. No, not really, but the baby started kicking, and I was poking and prodding to get it to continue. ...and when I came home the morning after the bachelorette party, my husband called me a rockstar and acted completely unsurprised that I got hit on. Bless him. OMG you and your Mom cleaned together! Hundreds of miles away from each other! Hilarious! i can't wait for the wedding either!! Maybe God is telling you to have a water birth? And YES to sitting on the birth ball at work. Your body will thank you.